This photo was submitted by Diana Birdwell. I really like the black and white treatment; I think this is a perfect example of a shot that looks great in BW due to the graphic shapes and strong contrast. I also like the title. 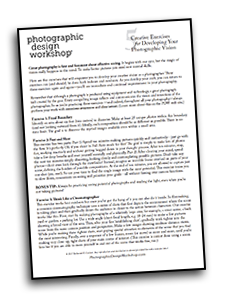 Good titles are important for photos, especially in critique or competition environments where everything contributes to the overall impression created on the viewer. This photo is chock full of lines and geometric shapes. What’s really cool is how the smooth, curving shape of the violin contrasts the harder, angular shapes of the swing. This kind of “contrast” is different that what we typically think of: tonal contrast. Consider that many strong images contain contrasts between various elements of the conposition: bold vs. subtle, large vs. small, soft vs. hard, smooth vs. textured, etc. As you’re making photographs may special attention to the juxtapositions you can create between elements, as these variations are what creates dramatic appeal. The rhythm created by the repeating pattern of the chain links mimics the rhythm of the slats on the back of the swing. This is a very effective technique: use a lesser dominant element to subtly mimic a stronger element. This creates a sense of cohesiveness in the picture, even when the viewer may not perceive exactly why this is. The lines of the strings mimics the lines of the swing, etc. Burning (darkening) the grass in the background will reduce the potential distraction from that part of the frame. Burning the lower left side, bottom and right corner will help hold the viewer’s eye within the frame and will draw more emphasis to the violin. 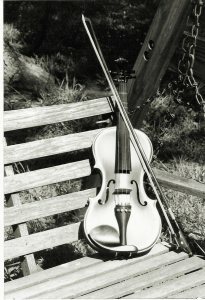 Cropping the left side and a bit off the bottom to remove the angled, vertical support on the back of the swing would reduce distraction there, too, and further emphasize the violin. Finally, I would have recommended using a polarizing filter to reduce the glare on the front of the violin. This would have revealed more detail in the wood grain and also would have provided more contrast and variation in tone throughout the frame. Nice image; thanks for submitting!